Exhibited: Royal Art Society of New South Wales, 1904, label verso, catalogue no 40, 4 gns. Comment: David Graeme Reid was born in Scotland c1861 and arrived in Australia in 1883. He established himself as a plumber and gas fitter in Newtown, Sydney. In 1884 he married Sarah Bignell and the couple had six children between 1885-1903. He lived in Black Street, Marrickville, from around 1900. Reid was an active member of the Sydney art scene up to the early 1930s. 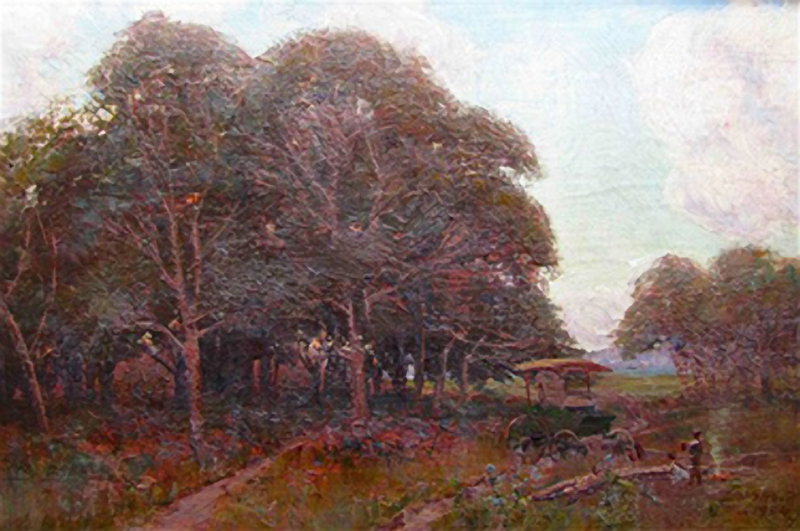 He trained under Julian Ashton and A. J. Daplyn and exhibited first at the Art Society of NSW, from 1890, then at the Society of artists and then with the Royal Art Society from 1902 where he served on its executive council for twelve years from 1908-18 and 1920-22. Several of his works and his photographic portrait were reproduced in 'Fifty Years of Australian Art, 1879-1929'. He painted mildly impressionistic pastoral watercolours in the Sydney region and three of these were included in the 1898 'Exhibition of Australian Art’ at the Grafton Gallery, London. He also produced some late career etchings. But his most impressive works are his landscape oils painted around the turn of the century. At Close of Day depicts a couple who have spent the afternoon picnicking. They have arrived in a small carriage (the horse must be grazing out of picture close by). A stretch of water, almost certainly Sydney Harbour, is glimpsed through the trees. The man appears to have just lifted the billy from the campfire and is perhaps preparing a final cup of tea before the trip home. prints and sculpture of museum quality for over 30 years. For examples of some recent works sold by us to public institutions please follow this link.